Astaxanthin is a pigment of the carotenoid complex found in the microalgae Haematococcus pluvialis present in Bio-Algae Concentrates. It is an oxygenated pigment called a xanthophyll. Its unique molecular structure gives it a superior antioxidant capacity. I will describe this extraordinary red pigment to illustrate the power of Bio-Algae Concentrates. Astaxanthin is 20 to 40 times more effective as an antioxidant than beta-carotene, up to 500 times more effective in inhibiting lipid peroxidation than Vitamin C, up to 1000 times more effective in inhibiting lipid peroxidation than Vitamin E, has greater anti-inflammatory capability than Vitamin E, has almost 4 times the antioxidant capacity of lutein, provides superior protection against UVA and UVB light-induced oxidative stress, is more stable in scavenging and quenching than beta-carotene, canthaxanthin and zeaxanthin, is highly potent in enhancing T1 and T2 helper cells and IgM and IgG (secondary immunity) production, is more effective than lycopene and lutein in enhancing liver microsome detoxification activity (enzymes that metabolize drugs), enhances the actions of Vitamins C and E in the body, and enhances the release of retinol (Vitamin A) from the liver when needed. 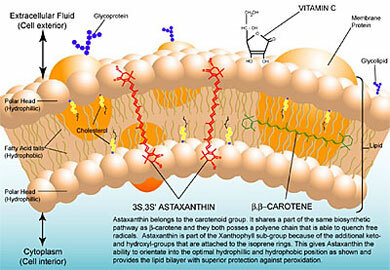 Those benefits described so far warrant astaxanthin’s nick name “the King of Carotenoids”, but there is more, read on. Independent of the Soviet studies, there have been numerous preclinical in vivo and in vitro studies and several human clinical trials to evaluate the efficacy of astaxanthin. A double-blind, placebo-controlled study demonstrated that astaxanthin was found to significantly increase strength and endurance. Another clinical study shows that Astaxanthin alleviates symptoms in patients with Helicobacter pylori (pre-ulcer indigestion). A third clinical study demonstrated bioavailability in humans. Additional human clinical studies are in progress. Astaxanthin has been shown to inhibit lipid peroxidation at the cell level, thus protecting the cell membrane and the mitochondrial membrane within the cell. It is able to cross the blood-brain barrier which makes it available to the eye, brain and central nervous system to alleviate oxidative stress that contributes to ocular and neurodegenerative diseases such as glaucoma and Alzheimer’s. Astaxanthin has also been shown to provide significantly more antioxidant capacity than other carotenoids and antioxidants, such as beta-carotene and Vitamin E.
Astaxanthin entraps free radicals by adding them to its long, double-bonded chain. Rather than donating an electron, astaxanthin stabilizes the cell membrane like a bridge, in that its polar end groups span the cell membrane thus increasing its rigidity and mechanical strength. 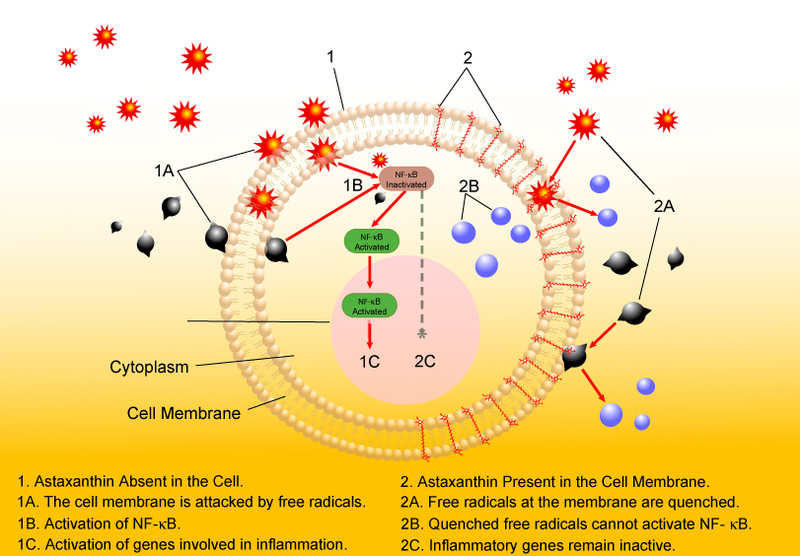 This allows astaxanthin to neutralize singlet and triplet oxygen generated by UVA and UVB radiation and other sources, to bind to lipoprotein, an efficient transport vehicle, making it more bioavailable, and to increase immune system function, including heightened production of antibody-secreting cells and Interleukin 2 and suppression of Interferon-gamma. Newer studies have shown that astaxanthin inhibits reactive oxygen species that cause inflammation, enhances the antioxidant actions of Vitamin E and Vitamin C, and encourages the release of Vitamin A from the liver when needed. Astaxanthin has 500-1000 times the antioxidant capacity of Vitamin E and 40 times the antioxidant capacity of beta-carotene. Many laboratory studies also indicate Astaxanthin works better than lutein, lycopene and tocotrienols. Following ingestion, astaxanthin is absorbed by the duodenal mucosa and transported to the liver where it binds with a lipoprotein for transport through the body and to the cell site. Because it is oxygenated, a xanthophyll has greater antioxidant capacity than many other carotenoids. Within the xanthophylls, the astaxanthin molecule contains the longest conjugated, double-bond polyene chain along with both hydroxy and carbonyl groups at each end. This configuration supports the greatest antioxidant capacity, peroxyl radical chain-breaking abilities, the incorporation of free radicals into its polyene chain thereby more effectively trapping them, and the enhancement of Vitamin C as an antioxidant. While other carotenoids and antioxidants may perform one or two of these functions, astaxanthin does them all and, in most cases, does them better. In addition to entrapping free radicals, astaxanthin also de-charges singlet and triplet oxygen and inhibits reactive oxygen, giving its anti-inflammatory properties. Astaxanthin has been classified as a “Pure Anti-oxidant” unlike certain other carotenoids such as β-carotene, lutein and lycopene that may show “Pro-oxidative” characteristics under certain conditions. This causes carotenoids to become a free radical that is capable of attacking the cells and constituents. Air pollution, exposure to ultraviolet light, radiation and smoking are also examples of pro-oxidants. 1.Miki, W., Biological functions and activities of animal carotenoids. Pure and Appl. Chem. 1991; 63: 141-6. 2. Shimizu, N., et al., Carotenoids as singlet oxygen quenchers in marine organisms. Fisheries Sci. 1996; 62: 134-7. 3. Fuji Chemical Industry Co., Ltd., Outsourced test by Collaborative Labs, Setauket, NY 2001. Highly Potent Antiperoxidative Activity of the Carotenoid Astaxanthin. Biochim Biophys Acta. 2001; 1512(2):251-8. Kinase-dependent NF-κB Activation. Mol. Cells 2003; 16(1):97-105. 6. Naito Y., et al., Prevention of Diabetic Nephropathy by Treatment with Astaxanthin in Diabetic db/db Mice. 7. Naguib Y.M.A., Antioxidant activities of Astaxanthin and related carotenoids. J. Agric. Food.Chem. 2000, 48, 1150-1154. Ophthalmol Vis Sci., 2003; 44: 2694-2701. 11. Lino et al., Kyoto 1991 ; In Japanese. 12. Babish J.G., Composition Exhibiting Synergistic Antioxidant Activity US Patent Applied 2000. 14. 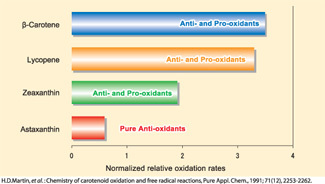 Martin, H. D. et al., Chemistry of carotenoid oxidation and free radical reactions. Pure Appl., 1999 71(12):2253-2262. Preclinical studies demonstrate that astaxanthin is safe, with no known side effects: On August 11, 1987, Roche Vitamins and Fine Chemicals (a division of Hoffman- La Roche, Inc.) submitted a petition to FDA concerning approval of synthetic astaxanthin as a feed additive for pigmentation in Salmonid fish. These studies were done to evaluate toxicity, mutagenicity, teratology and embryotoxicity, reproductive performance and tolerance. No observable anomalies in any study could be attributed to astaxanthin dose. It was concluded that the doses of astaxanthin tested had no effect on toxicity, mutagenicity, teratology, embryotoxicity, reproductive performance or tolerance. The entire petition is on file at La Haye Laboratories, Inc., consisting of seven volumes. It is also concluded that a natural astaxanthin should be safer than a synthetic version.